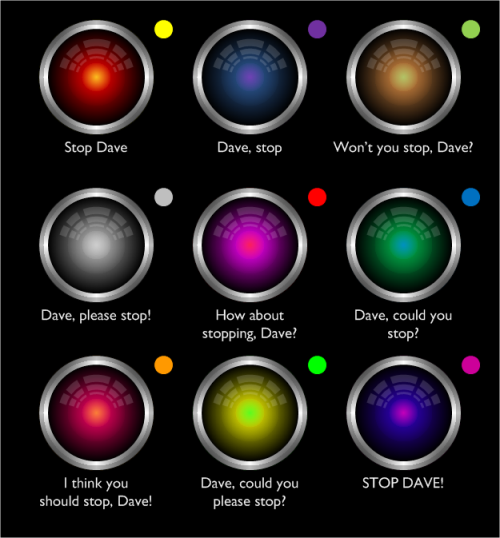 Dave, won’t you please read this article? Dave, don’t you think you should read this article? 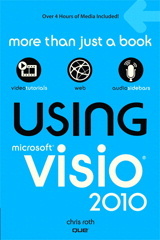 If you saw the announcement about the Visio 2010 beta program back in November 2010, you might have noticed a shiny-looking HAL 9000 graphic. 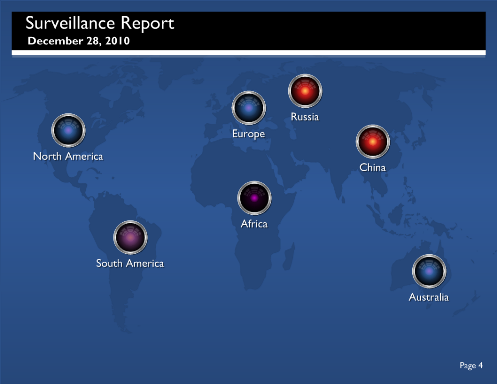 That beautifully fiery glowing orb was actually a Visio shape, which I have long intended to polish and release to the Visio public. The shape is fairly simple to use. You can type text on it and move it around using the yellow control handle, as with most shapes on this site. 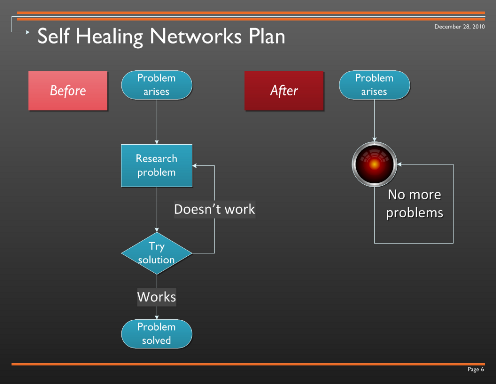 The coloring also behaves intelligently. Just pick a single fill color, and the shading will adjust automatically. The color you pick will be at the very center of the “eye”, and the other hues are determined automatically. The main reason I created this shape was because I was experimenting with color-selection and hue calculations. 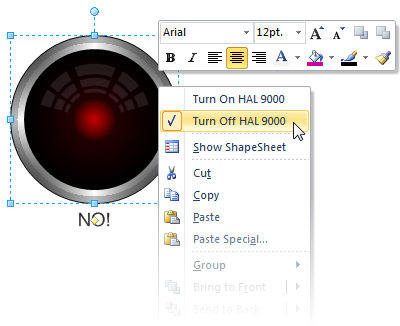 What Can you do with the HAL 9000 Visio Shape? Hmm, I don’t actually do any real work, I just create things for people who do. So I can only guess at what you folks do in your offices. I imagine you have meetings where you eat donuts and drink coffee. You probably document your processes and create other diagrams and drawings that visually show that you’re not just eating donuts and drinking coffee. 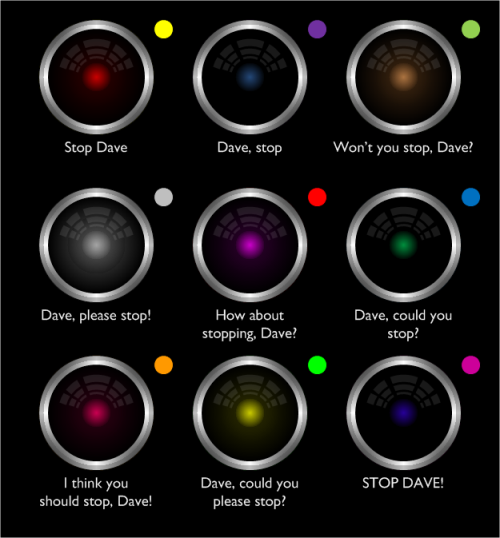 The HAL-9000 shape is rather eye-catching, and it could (and should!) be used in many, purposeful ways. Here are some suggestions that I dreamed up. Hopefully they will trigger your imagination. Use it wisely and with discretion. Hopefully you’ll get a few guffaws and get your point across! It’s not corrupt now. I just tried it and it’s great. Love it. 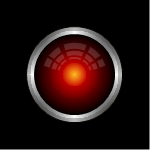 I LOVE THE HAL STENCIL. I MADE A SLIGHT IMPROVEMENT TO BY ADDING THE REST OF THE PANEL. I WILL TRY TO SEND IT TO YOU. Llenroc, love it! Try guy at vis guy dot com.